Nola... La cultura a "portata di mano"
Although perhaps not well-known to tourists, the area around Nola is extremely interesting. Travellers from all over the world come to celebrate the famous religious and folk holiday “Festa dei gigli”. Nola is also very interesting from an economic point of view. The Hotel is very close to wealthy realities such as the Cis, the Interporto, the Industrial Nola and Pomigliano’s Area and the just inaugurated large Shopping Centre called “Vulcano Buono”. There are many sporting events in the region and the Hotel (easily accessible from all the main cities) offers a welcoming stay for away teams in Campania. Besides, nearby (15 min.) we have the Kartodromo of Sarno, a stage for national and international events. 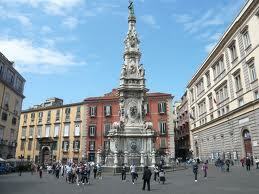 All the most renowned places of our beautiful region are comfortably accessible: Napoli (20 Km. ), Caserta (17 km. ), Pompei (35 Km.) and Costiera Amalfitana (40 Km. ).